Did you know that each year an estimated 2 million people in the UK suffer from food borne illnesses? But there is something that each of us can do to minimise this threat. The solution, proper hand washing. Buying soap alone does not constitute good hand hygiene practice but the selection of products combined with the correct procedures reduces the risk of spreading illness. Hygiene matters everywhere. From food service areas, hotels to building cleaning, everywhere you and your staff can come in contact with potentially contaminated surfaces and materials. That’s why the right hand hygiene programme matters. Being in contact with raw food, cleaning surfaces and equipment or handling waste can lead to hands becoming contaminated. Microbes (i.e. bacteria, fungi, viruses) are not visible and can spread unnoticeably from one person to another. Infections spread quickly and across borders. With the increase in globalisation and international transport, diseases can easily spread across the globe. According to the World Health Organization (WHO), every year between 3 and 5 million people suffer from influenza; of these up to 500,000 people die. As of January 2010, WHO registered 15,174 deaths caused by H1N1 in 209 countries. The unofficial death number is said to be much higher. In very sensitive areas such as food service preparation areas, careful hand disinfection procedures can be required to comply with legislations. Incorrect disinfection techniques, insufficient product and contact time are the most frequent sources of error during hand disinfection procedures. The visual (below) shows which areas are most frequently inappropriately treated during hand washing and hand disinfection. 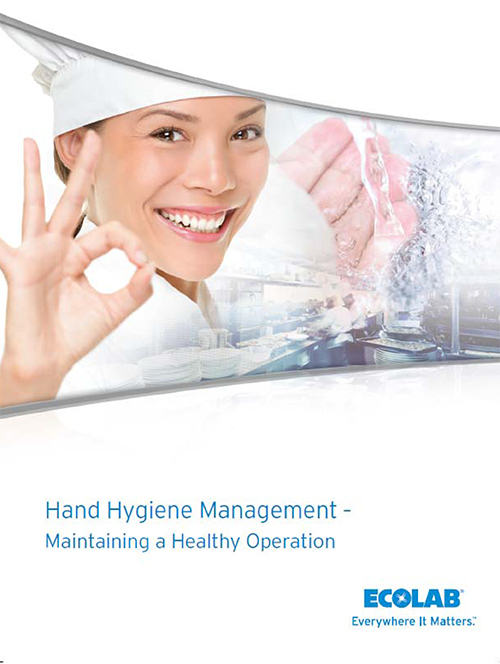 Download free Hand Hygiene Brochure now. With 2011 pro forma sales of $11 billion and more than 40,000 employees, Ecolab Inc. (NYSE: ECL) is the global leader in water, hygiene and energy technologies and services that provide and protect clean water, safe food, abundant energy and healthy environments. Ecolab delivers comprehensive programs and services to the food, energy, healthcare, industrial and hospitality markets in more than 160 countries.